There’s an old saying: “Eat breakfast like a king, lunch like a prince, and dinner like a pauper.” Many people do just the opposite, which is exactly the wrong way to eat if you’re trying to lose weight! Skimping on breakfast works against you if you’re trying to keep your energy up during the day and your mental performance level high. When you wake up, you’ve just gone eight hours without food, your body is craving nourishment, and your brain needs glucose to function at its best. Skipping breakfast sets you up for disaster in a number of different ways, but research shows that as many as 40 percent of Americans skip breakfast anyway, and many kids leave for school without it. People who skip breakfast are more than four times as likely to be obese than people who eat something in the morning. That’s right, skipping breakfast makes you fatter! Numerous studies over the years have shown that skipping breakfast impacts the behavior and mental performance of school kids. Students who eat breakfast have better memory and higher math and reading scores. In contrast, kids who go to school without breakfast have a higher number of behavior problems, including fighting, stealing, having difficulty with teachers, and not acknowledging rules. People who eat breakfast are far more likely to get a healthy intake of vitamins and minerals than those who don’t. In one study published in the Journal of the American College of Nutrition, researchers found that people who ate a hearty breakfast containing more than one-quarter of their daily calories had a higher intake of essential vitamins and minerals, and lower serum cholesterol levels to boot. Higher-protein breakfasts translate into a more sustained level of energy throughout the morning. Protein fills you up longer than carbs, so you’re less likely to have midmorning cravings. You’re also less likely to overeat at lunch or to get so hungry that you’ll grab whatever junk food you can get your hands on. Higher protein at breakfast increases metabolism, helping you maintain a healthy weight. In one study, a high-protein breakfast increased the metabolism of healthy young women by a shocking 100 percent! Eggs: Eggs are loaded with protein and other nutrients, such as phosphatidyl choline for the brain and heart. Scramble some eggs in coconut oil with spinach and sliced apples, seasoned with lemon pepper and turmeric (one of nature’s great anti-inflammatories). You’ll have a breakfast loaded with protein and nutrients. Choose pasture-fed, antibiotic-free eggs. Pasture-feeding yields eggs with a higher nutrient content. It’s also better for the chickens, and it doesn’t perpetuate antibiotic resistance like conventional chicken feed does. Greek yogurt: This thick yogurt contains active cultures, and it’s higher in protein than traditional yogurt. Try a cup with nuts, grapes, or berries for extra nutrition. Nut butter sandwich: Buy whole-grain bread and spread some natural peanut or almond butter on a slice, fold it in half, and you have an easy, no-cook breakfast. It goes great with a glass of skim milk or some hot green tea. Whey protein shake: If you can’t conceive of eating a protein source for breakfast that isn’t bacon or sausage, try some powdered whey protein for your protein source. It’s easy, inexpensive, and versatile; just be sure to buy pure whey protein without any added sugars or artificial sweeteners (visit www.BeatingSugarAddiction.com for recommended brands). 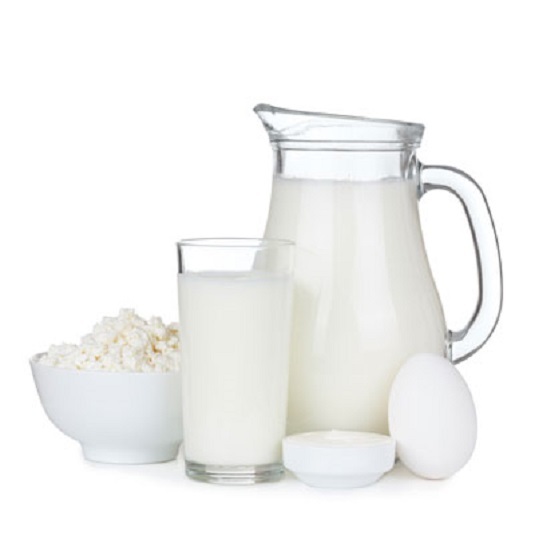 You can mix whey powder in water, milk, or juice, or you can sprinkle some on your cereal. You can make a smoothie by adding frozen berries or half a banana, or you can try powdered whey in cranberry juice, pomegranate juice, almond milk, or rice milk. Adding a splash of flax oil to the shake adds essential fats and helps the smoothie stick with you a little longer. Experiment and see what you like.